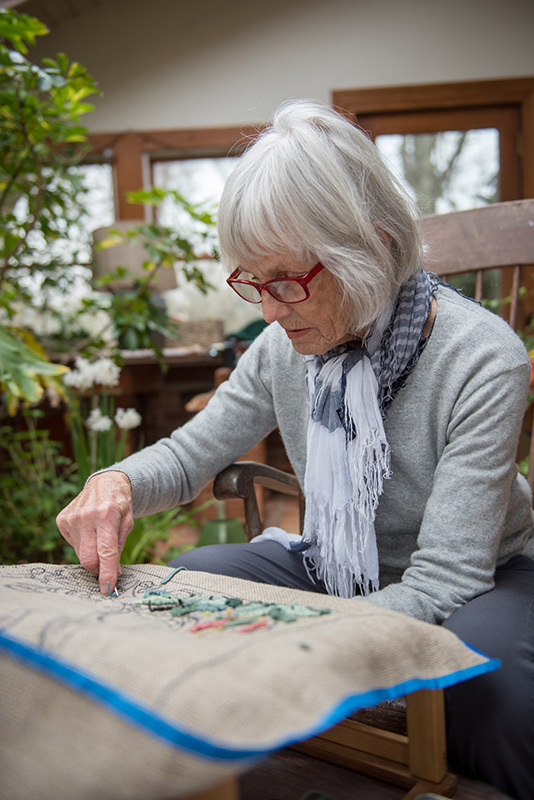 Sandy Broyard's passion becomes her handiwork. While enjoying the rugs at the 2018 Ag Fair, finding one made by Chilmark resident Sandy Broyard was a complete surprise. 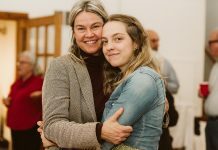 Broyard is better known as director of What’s Written Within, a modern improv dance company, plus there’s her work on Chilmark’s conservation commission, and she puts in time on the site review committee. In fact, I never before noticed a rug by Broyard, and it turned out to be her first submission. Now that life is quieter, I had the chance to visit Sandy at her Chilmark home and learn how she developed a passion for hooked rugs. Broyard’s home, though modern on the outside, feels like you’re stepping back in time upon entering. You’ll find dark wood, hand-stenciling on the stairs and bordering the upper edges of every wall, many antiques everywhere, and a wood-burning stove. Her home effuses history from every corner. There are hooked rugs on the floor, hanging on walls, sitting on chairs, and adorning tabletops. She shows me how the sun has faded the edge of a loop we see on one of her creations, but the original color can still be seen by pressing against the loop and looking below the surface. 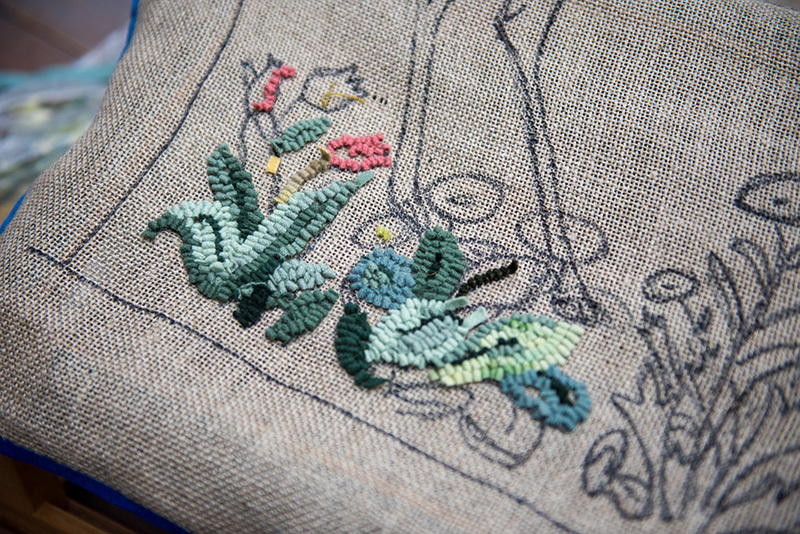 “I started rug hooking because I saw a tiny article on Valentine’s Day in the New York Times, 10 or 11 years ago, about a woman in upstate New York who had patterns for primitive rugs,” Sandy explains. “My [late] husband and I collected antique rugs, and I’ve always loved them for their unique quality, and also they’re all-American. Rug hooking has been around a long, long time. 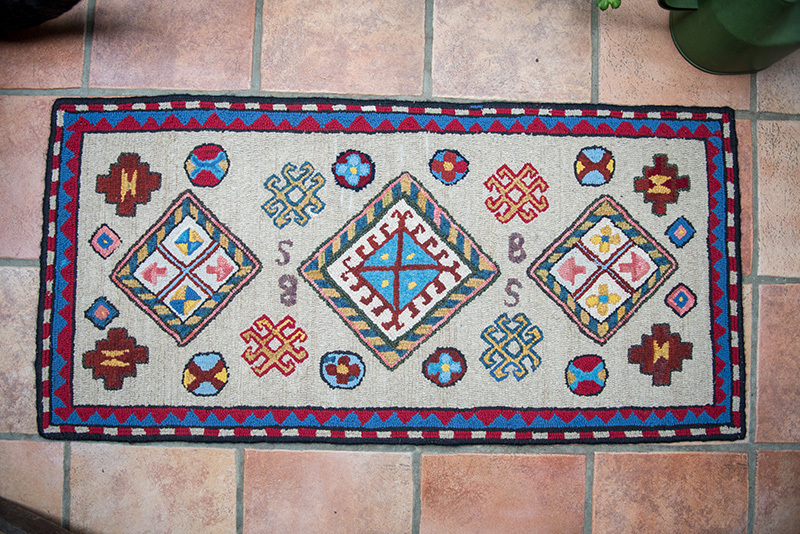 It became popular maybe in the 18th century, when the poor would make rugs out of worn clothing and used burlap bags. I love the fact these are all anonymous artists, and that they’re all unique visions.” None of the rugs Sandy and her husband collected are signed. We continued on the rug tour, looking at one from her collection that says “little house by the side of the road.” Though it’s quite faded, Sandy concedes, “It has a little Van Gogh in it, and reflects some woman’s rendition of her time and existence.” We walk around examples, collected over 25 or 30 years, that originally inspired her to take up this craft. The Broyards “lived in a series of 18th century houses in Connecticut, collected antiques, went to antiques shows and dealers, and we’d see these rugs and were so drawn to them. “This was from a purchased pattern made around 1875 to 1880, when the Sears and other catalogues began,” Sandy says about a lion rug she shows me. I wonder how many rugs Sandy has finished in the 12 years since she began hooking rugs, but then we’re on our way down the stairs. Does she still collect rugs? No. Does she ever travel to do research for her rugs? Well, no, because she admits her choreography keeps her too busy. She does, however, meet with a weekly group begun by Rosalie Powell, that now meets at former and new members’ homes. Broyard shows me the frame she works on, which holds the backing. The wool is underneath, and you stick a hook through and pull up. She uses a Fraser cloth-slitting machine, albeit the luxe model, admitting you’ve definitely married hooking when you purchase one. The main advantage is being able to change the cutter widths so easily. Although Broyard as yet has not inspired a family member to begin hooking, she did recently teach a friend the basics. She said she has given a lot of her rugs away to family members and friends, always adding, “Some are small.” Then she shows me some hooking techniques. It’s the first time I’ve seen rug hooking. Broyard adds, “There’s latch hooking, you can buy in kits. I did a couple, but it’s like idiot’s delight.” For rug hookers, “there’s the hunt for wool. We share our wools. It brings women together.” I was thoroughly grateful for my tour, and Sandy Broyard showing me what is involved in the art of rug hooking. I hope we’ll see more of her work in future Ag Fairs. 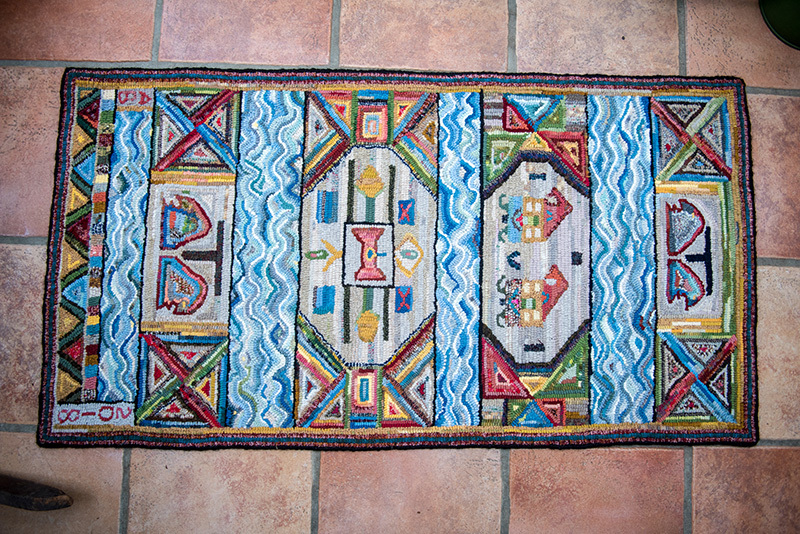 If you’re interested in rug hooking, contact Nancy Weaver, a member of the Island rug-hooking group, at nancyweavermv@hotmail.com to learn more.